But, it’s not always peaches and roses. Writing communities can’t be successful unless all the members are on the same page. Whether new or “experienced” in your writing communities, there are guidelines that will make or break yours—and everyone else’s—experience. If you can’t follow them, then you may not be ready to interact with others in this matter yet. Jeez. Thanks for the inspiration. I would rather be honest and help you than sugar coat it and help you figure it out. 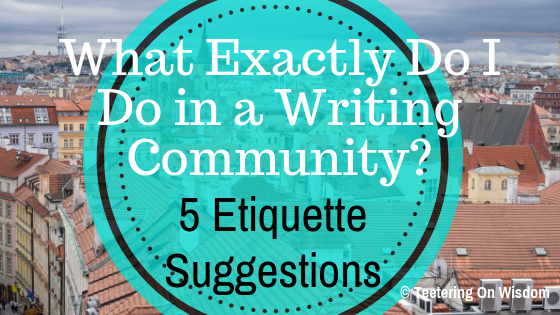 If you can follow these five guidelines, you shouldn’t regret joining any writing community. Check community guidelines/rules before joining. I cannot stress how important this is! If the owners take the time to develop and post rules/guidelines, then the group is probably monitored, and tired of spamming and disrespect. No advertising anything non-writing related, posts must be in English, and all posts need to be in the right category. I closely monitor the community, and I immediately ban anyone who doesn’t bother to follow our guidelines. There are different types of communities, as I addressed last time. So, when you find a writing community you want to join, the guidelines will let you know whether this is the place for you. If the moderators don’t allow you to do something, and you do it, you’ll be removed/banned—simple as that. Introduce yourself and welcome others when they do so. Notice: it didn’t ask for your latest book release, nor a link to your blog. When you include those things in your introduction, we already have an idea of why you’re there—to market—and we’re more likely to avoid you. Remember, we’re writers, joining to connect with writers. We’re not your reading audience. Along with that, when a new member comes along and introduces themselves, welcome them. Remember, communities are there to connect, support, and mentor one another. Give what you hope to receive. Wait, what if no one welcomed us when we came? That’s kind of childish to worry about and use as an excuse to do the same to others. It just repeats the cycle. Participate as much as you can. 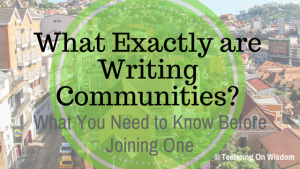 If you’re joining a community for a real reason—like, to learn more about how to be a better writer—then it only makes sense that you participate in the community, right? So many communities have thousands of members, but only one hundred of them are actually active (unless advertising, of course). Post your questions and answer others, as best you can. If you ask someone to read your work, read someone else’s. If there are prompts, practice a little, and post some of your favorites, too. Like, in my community, we have focused #CoffeehouseTalks in addition to normal help and discussion posts; we have a monthly #CoffeehouseChallenge to practice staying focused on our writing; we have #CoffeehousePrompts to practice and share our writing abilities. However, if our members don’t participate, what are they there for? Maybe just to chat with others, or offer their skills and services. There are communities specifically for that if that’s your purpose. I talk about the different writing community types here. Basically, if you join, participate as much as you can. If you can’t find the time to do so, then you may not be ready to be a dedicated writer yet, which is what the writing communities are working to help you be. Check previous posts and comments before posting your own. 9 times out of 10, what you’re going to say or ask has already been so. For more active/long term members, answering the same question over and over tends to breed animosity. 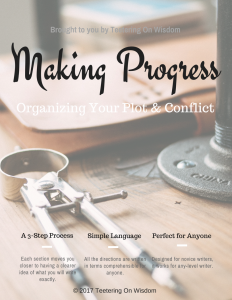 It’s nothing personal as much as it is a perception of carelessness on your part for not bothering to check—especially for common writing problems and questions. Anything that isn’t specific to a specific work. Like, “what writing software is best?”; “what do you think is a better word for…?”; “should I self-publish or go traditional?”; “how do I self-publish?”; Etcetera. Some communities may be nice enough to post a resource page for FAQ. But, realistically, you can Google and Pinterest all of this, and I can almost guarantee there are at least 7 articles that have addressed the topic already. Knowledge like that is easy to answer; save your community posts for more abstract and personal writing engagement. Now, I know that some platforms feel impossible to scroll through and find your answer or idea—like on Twitter and Facebook. The feeds are rapid, there’s a ton of people, many are answering right then.,.so much, I know. But, Facebook groups have a nifty search bar for just this problem on the main page. And, if it’s a quality tweet, you’ll be able to search similar answers and topics with hashtags. Try: #writers, #writing, #writinglife, #writingcommunity, #amwriting, #writingtips, #writerslife, and many more. Moreover, make sure to include tags in your tweets so others can find what you post! If someone has already said it, no need to say it again. I know it may feel like you’re being cheated out of participation then, but you can always take it from another angle to stay involved. But, never repeat others. That’s just unoriginal! Do not market your work. Of all the guidelines presented here, this is probably the most imperative. Authors/writers tend to be awful at marketing. 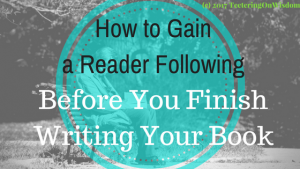 For some reason, new bloggers and authors believe that writers want to read non-writing related work. In writing communities, we are gathering as writers looking to connect and improve, not read others’ work—save that for book and niche communities. One of the best ways to get banned or ignored in a community is by posting your latest blog post and your newest release. Sharing your success and pride is one thing, but actually trying to get us to act on your announcement/offer will only let us know your ulterior motives to be among us. I know in my community, it says it on our community guidelines posted on the front page not to market. As soon as someone does it, I delete and ban them—period, point, blank. Now, we do have an “Articles of Interest” section for articles that will help writers. 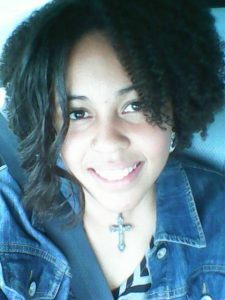 If you happen to run a blog for writers, that is more than welcome! I find that many communities have something similar—whether a special day to post or special area. Outside of that, don’t do it, please. Wow, you really are against marketing, aren’t you? You have no idea. It’s the ultimate spamming to me and the most inept and disrespectful thing you can impose on those of us who are there for all the right reasons. I know my community became inactive in its objectives for a long time because it was inundated with spamming. It took a month to clean it up so those who wanted to really come together could. It’s worked excellently ever since. So, when and where do you expect us to advertise our work? That’s our goal as writers, and you’re robbing us of that opportunity! I got you, Fam! Check back later for a post on just that issue and some suggestions! Or, if you want to know now, you can check out the many author publication and marketing articles I save on Pinterest. Plus, I suggest some appropriate ways to share our work in my article, “4 Ways to Share Your Work Without Being ‘THAT Guy’”. Essentially, like any other structured group or institution, writing (and other digital) communities can only be successful if it’s participants and members are serious about why they are there. Like I’ve mentioned before: communities can be the best or worst experience you ever have. But, if we encourage one another to behave appropriately and follow the guidelines, it will most likely be the former. If you’re in a writing community, what do you think helps make the best experience for you and your writing peers? Are there any other etiquette suggestions you have for members hoping to join one? Let us know in the comments below and on social media, of course. Plus, don’t forget to sign up for Writer’s Wisdom and access to freebies and opportunities with my bi-weekly newsletter.